St. Anthony Spirituality Center in Marathon City is a place of peace. This piece of heaven on earth is a place to rest, relax and re-energize. Most importantly, it is a place to reconnect with God. Peacefulness is felt as soon as you enter the front gates. A 140,000-square-foot building set on 40 wooded acres is surrounded by old-growth trees and visible memories from days gone by. It’s a place for meditation. It’s a place to silence your mind and still your heart. Ninety-six years of sandaled feet have walked the halls within this place of reflection, along with more than 90 years of retreatants. All came with their own personal stories and journeys of personal recovery. 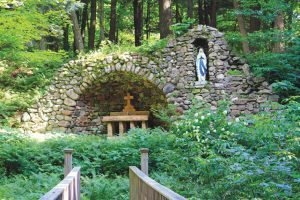 Personal reflection continues outside as Stations of the Cross surround the walking paths nestled among the trees that lead to a Marian Grotto and the Rib River. A cemetery holds the remains of 12 Capuchins, dating from 1924 to 2004. Father Peter Hesse, a priest who was actively engaged in recovery ministry at the center, is the last Capuchin buried in the serene and picturesque cemetery. In 1917, with Bishop Schwebach’s permission, the Capuchin Friars of Milwaukee purchased 40 acres in Marathon, which would be the site of their new house of studies. It was a surprising choice, perhaps, especially considering the distance—175 miles from Milwaukee—but the Capuchins had been on the lookout for a healthier site for the house of studies. And the people of Marathon made the Friars an offer they could not refuse: they volunteered to clear the land, donate all the stones, sand, and gravel needed, and haul all the building materials to the site, in order to encourage the Capuchins to choose Marathon. They were true to their word, and soon an extraordinary building began to take shape in the beautiful Wisconsin countryside. 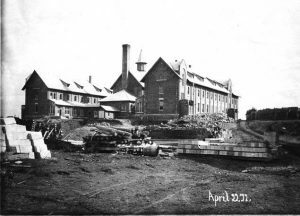 St. Anthony Retreat Center in 1922. The House of Studies was named in honor of St. Anthony of Padua, one of the most beloved saints of the Franciscan Order. There, young Capuchins undertook their philosophy and theology studies, and learned all kinds of practical skills as well, from building and farming to sewing. The Capuchins would be at the heart of Marathon and its happenings for decades to come. While the Capuchins used the grounds for a house of formation and monastery, they held retreats as early as the 1920s. Men from the surrounding area would come for retreats when the seminary was closed for the summer months. 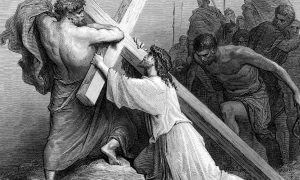 The friars were especially helpful to those suffering from addiction. Alcoholics Anonymous (AA) retreats have been held since the 1970s. Currently, three AA retreats are held throughout the year, along with one Al-Anon retreat to help those who are affected by someone suffering from alcoholism. 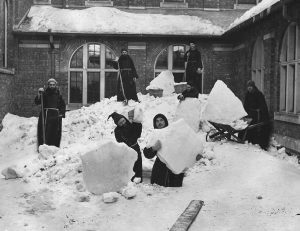 Capuchin Friars enjoy the snow during the Winter of 1922. Deacon Hilts says people need quiet time to listen to what God is saying to them. God speaks in whispers and nudges. If we don’t take the time to quiet ourselves and listen to the whispers and nudges, we might miss them. Once someone decides they want to do a retreat, he’s confident they’ll find an appealing subject among the wide variety available. The Spirituality Center hosts many outside groups, including the Diocese of La Crosse Lay Formation and Deacon Formation programs, along with priest and deacon retreats. 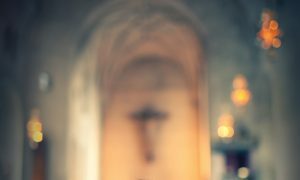 The center also sponsors retreats on such topics as human trafficking, meditation, embracing chaos, contemplative photography and icon writing, to name only a few. St. Anthony Spirituality Center is a place of peace for volunteers, too. In 2016, they hosted more than 3,000 retreatants, which required 12,000 volunteer hours. Until late 2013, the Spirituality Center was run by the Capuchins. With dwindling numbers, they were unable to continue their ministry here. Deciding it was unacceptable for the center to close, a group of lay people, along with some clergy and religious sisters, formed St Anthony’s of Marathon, Inc., a nonprofit corporation with by-laws consistent with the teachings of the Catholic Church. They purchased the property from the Capuchins and continue the mission the friars nurtured. Father Robert Streveler, senior priest for the Diocese of La Crosse, was involved in the transition and resides at the center. He provides the sacraments to retreatants, along with occasionally leading seminars. Sister Jolynn Brehm, FSPA, is also a resident who helps retreatants with spiritual direction and is vital in facilitating programs and scheduling. While times have changed since the Capuchins purchased land in Marathon City in 1917, made their habits and sandals in the basement and baked their own bread, the benefits of attending a spiritual and calming retreat in a peaceful setting remain the same. 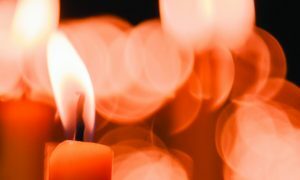 You can schedule your group or private retreat by contacting the St. Anthony Spirituality Center at sarcenter.com or by calling 715.443.2236.